The Mixed Use Zones Project will revise Portland’s Commercial and Central Employment zoning codes applied in Centers and Corridors outside of the Central City. These zones (CN1/2, CO1/2, CM, CS, CG, CX, EX), in which mixed uses are allowed, were created over 20 years ago when auto-oriented and low intensity commercial uses were more common. The project will address issues that arise with new more intensive mixed use buildings, such as: massing and design, transitions and step-downs, and ground floor uses. An initial concept proposal is being developed this fall. A more detailed Mixed Use Zones Concept Report is due this winter. Proposed zoning codes are expected in spring 2015. Public hearings on any proposed zoning codes are anticipated in June/July 2015. The Foster Rd, 82nd Ave, and Powell Blvd corridors will see these mixed use zones apply. This is a good opportunity to learn about the project and understand what it will mean for Foster-Powell. There are two workshops – downtown and north Portland. See the event flyer here for more information. Foster-Powell Street Tree Inventory Work Day #3 – This Saturday! 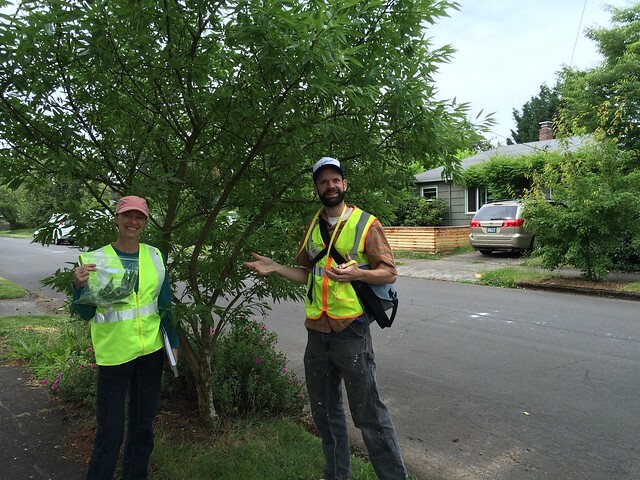 Join us in the Foster-Powell Street Tree Inventory ! Volunteers are collecting data on the type, health, and location of street trees in our neighborhood in order the prepare a street tree plan. The plan will identify gaps in canopy coverage and whether there is sufficient diversity in the types of street trees in the neighborhood. The work day is from 8:30-noon on Saturday, and volunteers are meeting at Performance Works Northwest. You don’t need to know about trees, just be interested in finding clues to help identify them!